දැන් මම කියන්න යන්නේ Automation Device Controller එක ගැන .අපිට මේ software එක උපයෝගී කරගනිමින් මෙම software එකට අනුකුලව හදාගත්ත Arduino Based Home Automation System Unit එකක් control කරන්න පුළුවන්.Arduino Based Home Automation System Unit එක හදන එක මම පස්සේ පොස්ට් කීපයක් විදිහට දාන්නම්.අපි දැන් බලමු මේ window එකේ මොනාද තියෙන්නේ සහ ඒවා වලින් මොනාද කරන්න පුළුවන් කියල . අපි දැන් මේකේ නම්බර පිළිවෙලට අරගෙන බලමු කොහොමද මේකෙන් වැඩ කරගන්නේ කියල. 1.මේ option එක select කරන්නේ අපි Automation Unit එක computer එකත් එක්ක data cable එකක් මාර්ගයෙන් serial ක්‍රමයට connect කරලා තියෙනවනම් විතරයි. 2. මේ option එක select කරන්නේ අපි Automation Unit එක computer එකත් එක්ක Wi-Fi මාර්ගයෙන් wireless ක්‍රමයට connect කරලා තියෙනවනම් විතරයි. අපි settings වල දීල තියෙන විදිහට default connection එකේ විදිහට මේ option දෙක auto select වෙලා තියෙනවා. 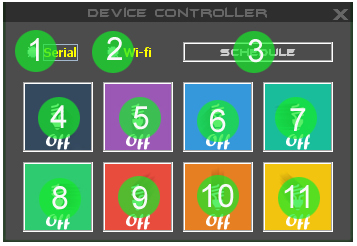 3.මේ button එක click කරපුවහම Device Controller Scheduler එක open වෙනවා. මේ window එක මාර්ගයෙන් අපිට පුළුවන් අපි කලින් දීල තියෙන වේලාවන් සහ දවස් අනුව විදුලි උපකරණ හසුරුවන්න. 1.මේ option එක select කිරීම මගින් scheduler එක enable වෙනවා. 2.මෙතනින් අපිට අවශ්‍ය device එක select කරගත යුතුයි. 3.මෙතනින් අවශ්‍ය කාලයේ පැය ප්‍රමාණය select කරගත යුතුයි. 4.මෙතනින් අවශ්‍ය කාලයේ විනාඩි ප්‍රමාණය select කරගත යුතුයි. 5.මෙතනින් අවශ්‍ය හෝරාව select කරගත යුතුයි. 6.මෙතනින් අවශ්‍ය දවස select කරගත යුතුයි. 7.මෙතනින් අවශ්‍ය තත්වය select කරගත යුතුයි. 8.මෙම button එක click කිඅරහම අපි උඩින් දීල තියෙන දවසට එම පැය හා විනාඩියට device එක කුමන තත්වයක් ගන්න ඕනෙද කියලrecord එකක් database එකට ඇතුලත් වෙනවා. 9.මේ button එක මගින් අපි කලින් දීල තියෙන schedule record database එකෙන් remove කරගන්න පුළුවන්.අපි list (10) එකෙන් අපිට remove කිරීමට අවශ්‍ය record එක select කරලා මෙම button එක click කරන්න ඕනේ. 10.අපි database එකට add කරගන්න schedule records මේ list එකේ පෙන්නනවා. 4.මෙය ඒක වරක් click කිරීම මගින් device 01 on වේ.තව වරක් click කල විට device 01 off වේ. 5.මෙය ඒක වරක් click කිරීම මගින් device 02 on වේ.තව වරක් click කල විට device 02 off වේ. 6.මෙය ඒක වරක් click කිරීම මගින් device 03 on වේ.තව වරක් click කල විට device 03 off වේ. 7.මෙය ඒක වරක් click කිරීම මගින් device 04 on වේ.තව වරක් click කල විට device 04 off වේ. 8.මෙය ඒක වරක් click කිරීම මගින් device 05 on වේ.තව වරක් click කල විට device 05 off වේ. 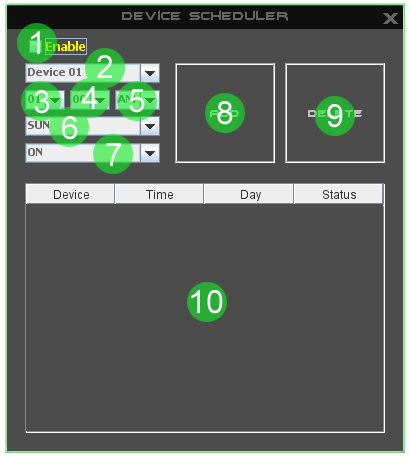 9.මෙය ඒක වරක් click කිරීම මගින් device 06 on වේ.තව වරක් click කල විට device 06 off වේ. 10.මෙය ඒක වරක් click කිරීම මගින් device 07 on වේ.තව වරක් click කල විට device 07 off වේ. 11.මෙය ඒක වරක් click කිරීම මගින් device 08 on වේ.තව වරක් click කල විට device 08 off වේ. මෙහි 4 සිට 11 වෙනකන් තියෙන ඔක්කොම button click කරහම ඒ device එක තියෙන තත්ත්වය ඒ icon මගින් පෙන්නනවා . අපි ඊලග පොස්ට් එකෙන් බලමු picture library application එක ගැන.